The Murphy house as it appeared in Architectural Forum, April 1941. The following article by nomination author Michael R. Allen was published as “Joseph Murphy’s Own Residence Now Listed on National Register” in the Fall 2010 NewsLetter of the Society of Architectural Historians, St. Louis Chapter. The essay is based on text from the National Register of Historic Places nomination for the Joseph and Ann Murphy House (listed May 10, 2010). Designed by prominent St. Louis architect and educator Joseph Denis Murphy (1907-1995) for his own residence, the Joseph and Ann Murphy Residence at 7901 Stanford Avenue in University City was built in 1938-1939 but expanded in 1950 and 1962. Built in the same year that Frank Lloyd Wright published his vision for the Usonian house in Architectural Forum, the Murphy Residence demonstrates Murphy’s contemporary and unique vision of residential architecture. While Murphy’s residential program has clear parallels to Wright’s, Murphy developed it simultaneously rather than subsequently. 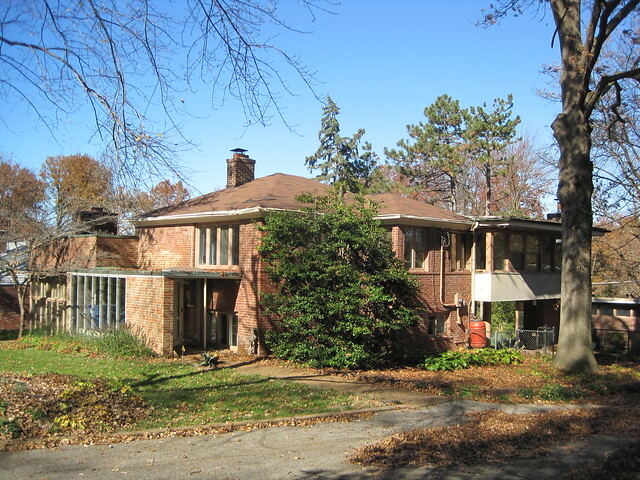 In 1938, few Modern Movement Houses had been built in the St. Louis area, although within twenty years Modern styles would dominate suburban residential construction. Newly arrived in St. Louis and serving on the faculty of the Washington University School of Architecture, Joseph D. Murphy’s career was at its start when he designed his own home. The house was one of the first small Modern Movement houses to attain national publication, and it contributed to wide interest in Modern houses in the St. Louis area. Joseph Murphy’s submission to the 1934 Flat Glass Industry Architectural Competition. Courtesy of Mary Brunstrom. In the 1930s, many American architects were working on developing ideas about Modern houses. With modernism on the rise in America amid the Great Depression, many American architects endeavored to create affordable small house designs that would advance Modern design principles. Joseph Murphy delved into the national architectural discussion on houses early, and published his first Modern house prototype ahead of Frank Lloyd Wright’s widely influential publication of his “Usonian” house. Frank Lloyd Wright’s Usonian House would become the American standard for the small, affordable Modern house, but Murphy had already provided his own prototype when Wright first published his ideal. 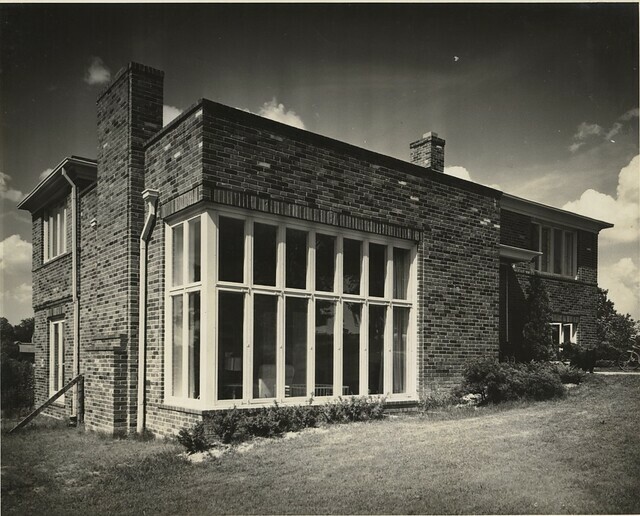 According to Brunstrom’s unpublished biographical essay on Murphy, the young architect entered a house designed for “sunshine and fresh air” into the Flat Glass Industry Architectural Competition of 1934. 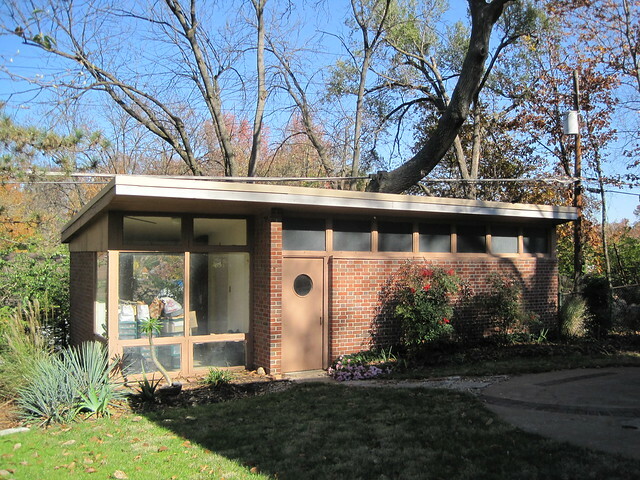 Murphy’s design was published in Pencil Points as well as the Kansas City Star, in whose pages a reporter described the model house as “decidedly modern”. Murphy’s house had an open floor plan in the living area, simple use of the easily-available materials of fieldstone, reinforced concrete and glass, and maximized flow of light, air and circulation between interior and exterior. Murphy’s model house devoted 75% of external wall area to glass. Furthermore, the size of this new house was fairly small. The house sat close to the front of its lot to give back yard a wide space and the rear windows an expansive view. Harmony with natural surroundings was emphasized in Murphy’s plan. The house was never built. Murphy echoed elements of the earlier house design in “Design for a Doctor’s Residence,” his submission to the Suntile Architecture Competition that was published in Pencil Points in August 1937. “Design for a Doctor’s Residence,” Joseph Murphy’s submission to the Suntile Architecture Competition, published in Pencil Points, August 1937. Courtesy of Caroline Murphy DeForest. Murphy’s published small house prototype was followed four years later by Wright’s January 1938 publication of the first Usonian house in Architectural Forum. The Usonian house was the proposed solution to what the architect identified as the “small house problem” of the United States. Wright had just completed the Herbert Jacobs I House in Madison, Wisconsin (listed in the National Register of Historic Places, 7/31/2003). Decidedly modernist, with a 1,340 square feet plan and with a budget of $5,500, the house demonstrated Wright’s ideas for developing a modern home affordable to the American middle class and appropriate for the suburban locations sought by the middle class. In the article, Wright discusses making “simplifications” to construction so that the Jacobs family could afford their house: off-site pre-fabrication to keep materials and labor costs down, reduction of the floor space common for a family house by consolidating the living room and dining room and placing all living space on one floor sitting on a concrete slab, use of many operable windows to help with heating and cooling and radiant floor heating. If Wright had encountered Joseph D. Murphy’s “sunshine and fresh air” design, the architect made no mention of it in his article. 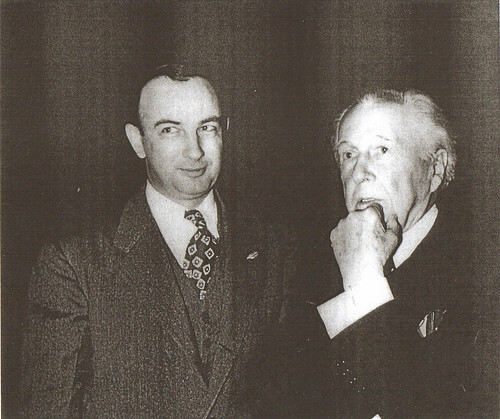 Joseph D. Murphy with Frank Lloyd Wright in 1957 when Murphy was named a Fellow of the American Institute of Architects. While Wright influenced Joseph Murphy, Murphy’s contribution to residential design and the particular issue of the small house would be as singular as the more famous architect’s. Thus Murphy’s philosophy and Wright’s Usonian form are complementary contemporaries, with key similarities and significant differences. Murphy’s foray did not win national acclaim, but it was regionally significant. Furthermore, even after building his own home, Murphy continued to lecture and write about his residential ideas. According to Brunstrom in an unpublished essay, Murphy believed the small house to be “one of the major responsibilities of the architect.” In 1946, he told a radio audience during a program entitled “The House of Today” that “[t]he use of good design is cheap at any price.” Clearly, Murphy applied as much thought to the small house “problem” as did Wright, and was influenced by the more famous architect. Yet Murphy sought a program less bound by the formulas of form, style and cost. In 1938, Murphy purchased a large lot on Stanford Avenue in the western end of the inner-ring St. Louis suburb of University City. At the time, this section of University City was only recently being developed, and the area immediately north and west of the lot was not yet subdivided. The site sloped northward to a wooded area. At the time, Benlou Avenue ran north into the property; this street was later vacated and became part of the property. On this lot, Joseph D. Murphy aimed to build a modest-sized, fully Modern house for his family. Coincidentally, earlier in the year, Frank Lloyd Wright had published his article on Usonian houses. The Murphy residence upon completion, 1939. Courtesy of Caroline Murphy DeForest. Dated September 12, 1938, the blueprints for the residence list “J.D. Murphy & K.F. Wischmeyer” as the architects. This was just a courtesy to the partnership, since Murphy was fully responsible for the design. Here was Murphy’s first chance to apply his philosophy of residential design to a relatively small house (approximately 2400 square feet) that would actually be constructed. In some ways, the Murphy Residence maintained traditions. The use of red brick was conventional for the period, as was the entrance with its masonry pilasters, wooden ogee cornice and two-panel door. However, in almost every other respect the home was fully modernist and allowed Murphy to demonstrate the principles that Wright had articulated to the nation. 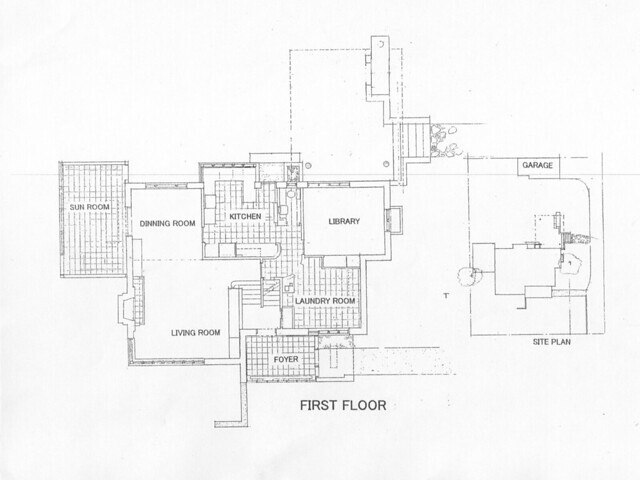 First floor plan of the Murphy residence. Courtesy of Caroline Murphy DeForest. All of the features in plan, site placement and design can be traced to the vision that Joseph D. Murphy articulated in both the 1934 “sunshine and fresh air” house and the 1937 doctor’s residence plans. The basic plan for the house was a two-story hipped-roof section with a prominent flat-roofed living room on the front elevation. Although laid out on two levels, the house nonetheless had a horizontal orientation reinforced by the downward slopes of the roof. The house lacked any traditional ornamentation beyond the cornice over the entrance, instead relying on linear masonry patterns around doors and windows to produce subtle variation in depth of the wall plane. The living room’s large mitered window ribbon was a break from convention, and a type of fenestration found both in Wright’s Prairie School architecture and the more austere International Style. Here, the use of the large window echoed back to Murphy’s 1934 prototype design with its large glass walls. The living room would have ample natural light and ventilation to cut energy usage. All other window openings were wide and carried casement windows in groups to allow for variation in natural air intake. Another interesting and environmentally sensitive feature of the residence was the incorporation of the site slope into the design. In doing this, Murphy had to place the entrance to the house at a half-level between the two levels, a placement almost unknown in St. Louis residential architecture. Current view of the Murphy residence, showing the 1950 bedroom addition on the right and the 1962 foyer enclosure at left. The slope-roofed garage and studio behind the house dates to 1950. 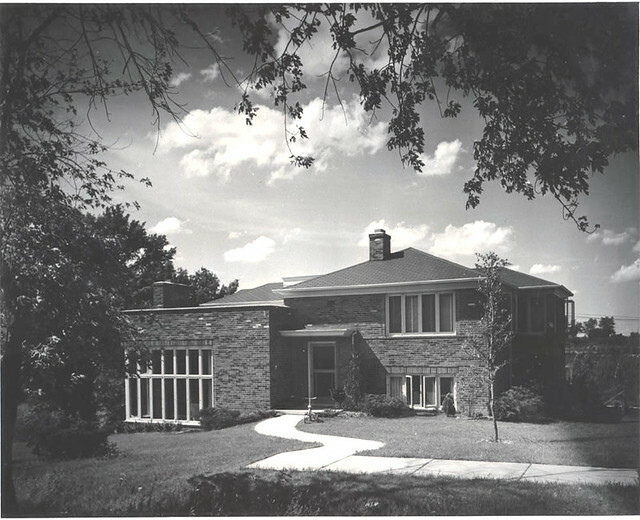 The Murphy Residence stands as a key predecessor to the wave of Modern residential architecture that would be built in St. Louis, especially in St. Louis County, between 1940 and 1960. The influence of Murphy’s residential vision can be seen in scores of subdivision homes whose histories have not yet been written. Many significant Modern houses employ the qualities that Murphy expressed in his own home: the consolidation of the basement and first floor, the arrangement of a large, open living and dining area buffered from the house’s private areas by a kitchen, the use of large windows, a central hipped roof, the asymmetry and the banking of the house in a sloped site. The Modern small house, Modern residential architecture in St. Louis County and the career of Joseph Murphy all developed greatly in the decades following construction of the Joseph and Ann Murphy Residence. “101 New Houses.” Architectural Forum vol. 71 no. 4, October 1939. Brunstrom, Mary Reid. “Joseph D. Murphy: Architect and Teacher.” Unpublished essay. Murphy, Joseph D. “Design for a Doctor’s Residence.” Pencil Points, August 1937. Nomination of Joseph D. Murphy, Advancement to Fellowship. St. Louis, Missouri: Collection of the American Institute of Architects, St. Louis Chapter. Sergeant, John. Frank Lloyd Wright’s Usonian Houses: The Case for Organic Architecture. New York: Whitney Library of Design, 1976.